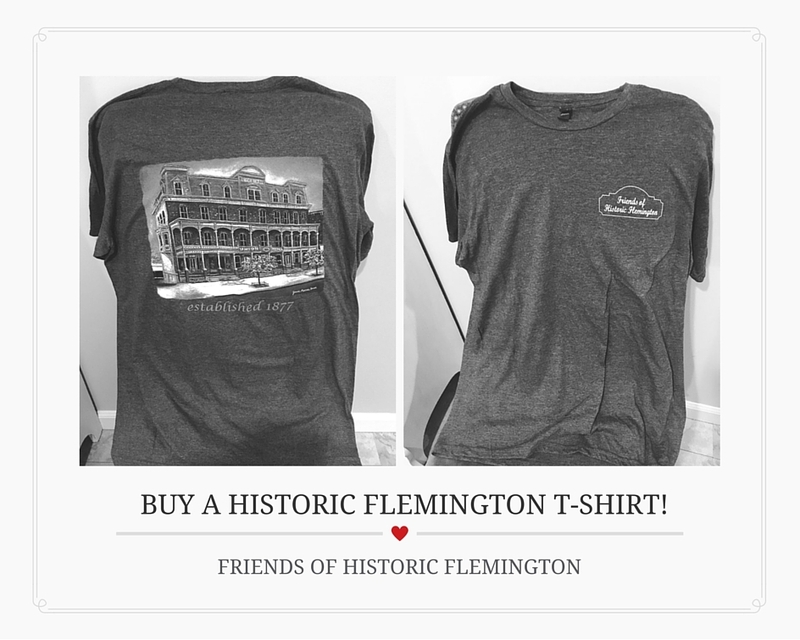 Now You Can Have Your Own Friends of Historic Flemington T-Shirt For Only $20! Your purchase supports Friends of Historic Flemington, LLC’s efforts to promote the adaptive reuse of Flemington significant historic buildings, including the Union Hotel, which is critical to the future of our town and greatly appreciated. Please use the form to order below and pay securely with a debit or credit card through PayPal. You can pick it up at our table on Saturday (9am-3pm) at the Stangl Farmers’ Market, on Sunday (9am-1pm) at the Dvoor Farmers’ Market, or at one of the Flemington Car Shows (4:30pm-8:30pm at 111 Main St). Please bring a printed copy of your payment receipt. We are now able to accept payment by credit card at our event display tables. Yes! If you’d prefer to have your shirt(s) shipped, we can do so for a flat fee of $8 for an unlimited number of shirts. Please send us a note through the Contact form. We will invoice you through PayPal for this fee, as our order simple online order form is not set up for shipping. How else can I assist in your efforts? Join our email list and stay informed. Make a donation in person at one of our event tables or online. Contact us to volunteer and help us get the word out about the right way to redevelopment Historic Main Street.